Muay Thai is one of the main attractions in Thailand. Although this country is known for the beautiful beaches and the amazing nature, in recent time this sport is becoming another ambassador of this stunning Asian country. Muay Thai is a national sport in Thailand and of course the most popular sport there. The language barrier is not a problem if you are interested in training Muay Thai in Thailand. 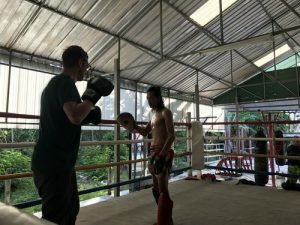 A huge number of Muay Thai camps in Thailand have trainers that completely understand and speak English so they can teach foreigners without problems. Since Muay Thai is the most popular sport there, these Muay Thai camps can be found all over Thailand. However, most Muay Thai camps are located in the biggest cities (especially Bangkok) and on Phuket Island (the most popular tourist destination in Thailand). Finding the right Muay Thai camp for you should be an easy process. Nowadays, Muay Thai camps in Thailand are fully aware of the fact that many foreigners are traveling to Thailand in order to train Muay Thai and enjoy the beauties of Thailand too. Since Thailand has a warm climate, joining a Muay Thai can be done at any season and most of the camps are opened during the whole year. Of course, if you want to enjoy exploring Thailand and its natural beauties too than you should avoid the monsoon season. Those who don’t like very hot weather should probably avoid summer period. When it comes to accommodation It is good to know that there are many cheap hotels and hostels that offer good accommodation for foreigners and you can even find Muay Thai camps that are offering their own accommodation. Scorpion Muay Thai training camp is a good example of that. This camp is offering rooms with fans or air conditioning so students can visit this camp in any period of the year. Besides that Scorpion Muay Thai has quality trainers, top notch equipment and even its own stadium where advanced Muay Thai athletes can participate in a fight. This camp is also welcoming amateurs and even people that want to train Muay Thai just to lose weight or sculpt their bodies. Muay Thai training in Thailand is more than a regular training – it is a period in your life that you will never forget!